“A wonderful day for our community” is how County Executive MaryEllen Odell described Putnam’s 7th Mentoring Day, where participants from CAREERS Support Solutions, The Arc Putnam and Carmel High School joined mentors from Putnam County Departments for a day of sharing skills and learning about about others in the community. Participants gathered at Cornerstone Park in Carmel at 9:00 am on May 31st for mentors to meet the participants they will be working with for the morning. 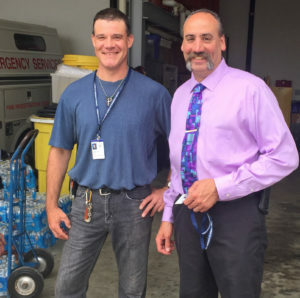 Each County department offered a tour of their facility and the chance for their mentees to spend some time on tasks that staff perform each day. At 1:00 pm, everyone returns to Cornerstone Park to share the highlights of their experience with County Executive Odell, who presented each participant with a certificate and invited them to join us again next year. Our thanks to County Executive MaryEllen Odell and all the County staff who make our participants feel welcome each year! Jessic Eckback gets a think you hug from Senior Resources site manager Lisa Formisano. Shane McDonough spent the morning in the Health Department helping with copying and labeling cards. Chef Sean Sampson from the Kohler Center was impressed with Nick Cinque, who made over 140 hamburgers! Nick, a participant in our Ambition In Motion (AIM) program, also helped with prep and serving lunches to the Seniors at the center. 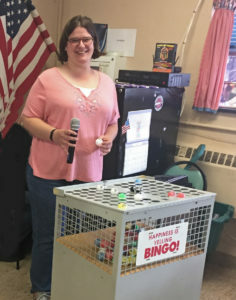 Jessica Eckback had a great time calling Bingo numbers at the department of Senior Resources and wants to go back o to help out again! CAREERS Executive Director Tina Cornish-Lauria thanks County Executive Mary Ellen Odell for her efforts to make our 7th Mentoring Day a great success for all participants. Ken Clair thanks Chuck Lusk for lending a hand at the Emergency Services Department. 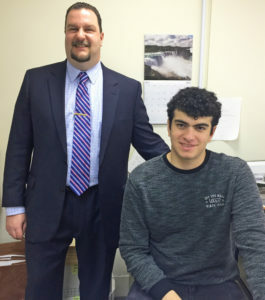 County Clerk Michael Bartolotti introduces Stephen to his department. Highways and Facilities was a very interesting department for CHS student Andrew Keane to spend the morning. 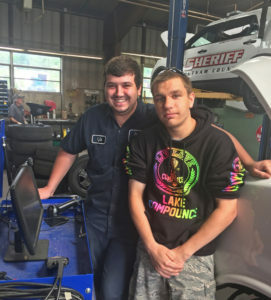 His mentor Kyle Yulick was happy to share his knowledge of the County’s vehicle inspection system. 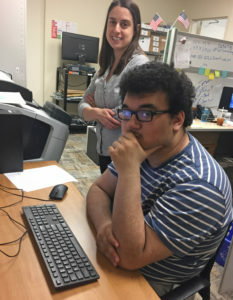 CHS student Alexander Perugini sharpened his computer design skills in the County’s IT Department. 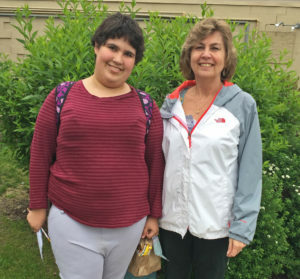 CHS student Adrianna Beers enjoyed her time in the Probation Department with her mentor Gigi. 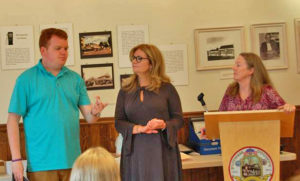 Shane McDonough shares what he learned in the Health Department with County Executive Odell and Tina Cornish-Lauria.